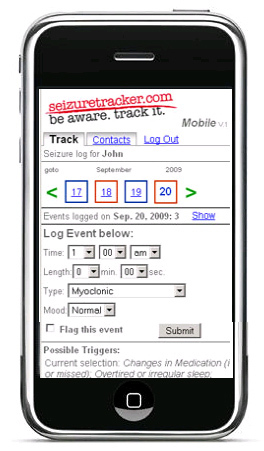 SeizureTracker.com - Logging Seizure related rescue medications on your mobile phone. SeizureTracker.com will detect most mobile browsers and automatically redirect you to the mobile optimized site. If for some reason this is not done automatically you can access it by visiting the 'Go Mobile' page from the Seizure Tracker home page. It is accessible on the mobile interface by clicking on the "Rescue Medication" link from the "Track" page. 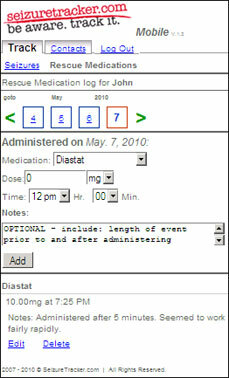 ***The rescue medication tool must also be selected in the account settings. Users must access the account setting page through the non-mobile site. • The calendar navigation interface include four days instead of a full calendar month. Red highlighted days represent seizure activity not rescue medication dosing. Click on dates to go to that particular day. • Enter in seizure rescue medication name, dose, units, time and any associated notes. Click the Add button. • All dosing that have been entered on that day will be listed at the bottom of the page. • There is also an option to edit or delete each entry.